So... You have been slaving away, day and night for months and have finally completed your latest musical masterpiece. Or maybe you only spent ten minutes throwing together some audio mish-mash. Whatever it was, if you are ready to do some recording and digital is the way you want to go, you have a few options. Well, at least two. 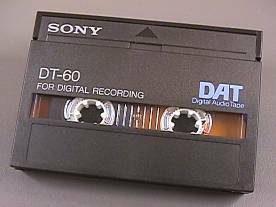 Digital Audio Tape (DAT) was developed by Sony and Philips as a recordable format with quality comparable to that of CD. Much like systems used in video recorders, a rotary-head design allows for uncompressed data storage - a big plus for digital audio. Most DAT recorders provide the ability to record with either a 44.1 or 48 kHz sampling rate. This uses 16-bit linear encoding and provides up to 120 minutes of continuous stereo recording with a frequency response of 2 - 22 kHz. Some recorders also include a 32 kHz, 12-bit non-linear encoding mode. This provides up to 240 minutes of stereo recording, with a frequency response of 2 - 14.5 kHz. In addition to sound data, DAT also includes the capability of recording subcode information such as absolute time, track numbers and end-of-tape markers. One of the main advantages of DAT is its ability to generate exact duplicate, multi-generation copies. However, to deter music piracy, most DAT recorders conform to the SCMS copy protection scheme. 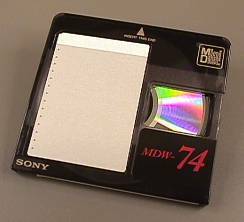 Mini Disc (MD) was introduced by Sony, making use of magneto-optical technology to provide superior reusability, fast data access and enhanced editing capabilities. Recording is always done at 44.1 kHz and a sampling rate converter is included that changes 32 and 48 kHz digital inputs. MD provides up to 74 minutes of stereo audio recording or 148 minutes in mono mode. To reduce the amount of digital data, MD uses a lossy compression scheme called Adaptive TRansform Acoustic Coding (ATRAC). ATRAC is based on psychoacoustic algorithms that understand "normal" hearing functions and thresholds. These filter/reduction algorithms create a data stream with a 5:1 compression ratio. ATRAC has gone through several revisions, offering even greater improvements in sound quality with each update. Use of ATRAC or any other lossy compression scheme, however, means that multi-generation copies, even when recorded digitally, suffer from increased data degradation. So, exact duplicate copying is not possible. Like DAT, MD also conforms to the SCMS standard. MD storage is very much like that of a hard disk. Unlike tape based systems, an audio track does not have to be one continuous data stream. It can be spread out over different areas of the disc. During playback, a read-ahead buffer insures that audio plays seamlessly while the read mechanism moves about the disc. A Table of Contents (TOC) contains a list of starting/editing locations for up to 254 tracks. Each track can be quickly accessed, fully or partially erased, split, combined, reordered, named (up to 1700 characters per disc) and date/time stamped. Some recorders even include a handy undo function to restore your last edit. The Digital Compact Cassette (DCC) was created by Philips as an alternative to the analog cassette, which they also invented. Like analog cassette recorders, a stationary head is used to write audio data. Because similar mechanics are used, DCC machines were designed to also play analog cassettes. DCC uses a lossy data compression technique called Precision Adaptive Sub-band Coding (PASC) that removes "in-audible" signal data to achieve a 4:1 compression ratio (essentially the MPEG Layer 1 audio standard). This allows up to 90 minutes of recording. Like MD, copies will suffer from increased degradation with each generation. A digital copy made from DCC or MD to DAT however, would not have this problem as the compression encoding algorithm is not used. Although I was unable to test a DCC system, articles I researched suggested that it was indistinguishable from CD. In Canada, DCC is practically non-existent. In fact, searching the internet for more information, I was not surprised to come across an article that indicated that Philips had discontinued development of DCC devices - at least at a consumer level. A frequency graph (or sonogram) depicts sound through time on the X-Axis with frequency on the Y-Axis and amplitude denoted by color. These graphs are created through a mathematical process called Fast Fourier Transform (FFT) and are very useful in analyzing frequency response. The Serial Copy Management System (SCMS) was developed to reduce illegal copying/distribution of commercial audio recordings. In systems with SCMS implementation you can record from a 44.1 kHz digital source (such as CD) via a digital input; however, you can not re-record that copy to another digital recorder through its digital input. At 32 or 48 kHz, you can record a source (such as DAT) digitally (first generation) and then re-record that copy (second generation); however, subsequent digital copies from that second generation copy are not possible. Some older SCMS implementations will not allow second generation digital copies at any data rate. Analog recordings are not restricted. Many professional level digital recorders are exempt from SCMS or at least provide a way to disable the protection scheme. If a recorder insists on using SCMS and it is a real problem for you, do not dismay, there are ways to defeat it. Try an internet search on that device, it will likely turn up all kinds of interesting secrets. A short music clip and a 20 Hz - 20 kHz sine wave sweep were played, using a Yamaha CDX-1050 CD player, and recorded with each recorder through its digital input. The MD recorder was also tested using analog connections. A Sony DTC-690 DAT recorder and Sony MDS-JE510 MD recorder were used for the test. All recordings were done in stereo at 44.1 kHz. The DAT recorder used did not allow analog recording at 44.1 kHz so, to avoid confusion, this analog test is not graphically compared here. In all cases, the digital and analog audio cables provided with the MDS-JE510 were used. The source CD, DAT and MD recordings were digitally transferred to the Amiga to insure that no changes in the sound would be introduced. This was done using a Maestro Pro digital audio I/O card. Once transferred to the Amiga, the music clip's left and right channels were mixed to mono using Soundprobe. In the case of the sine wave sweeps, the left channel was removed. Next, SoundFX was used to crop each sound and to isolate a five second section from each of the music clips. These short sections were then loaded into Soundprobe to generate the frequency graphs in Figures 1-5. Figure 1 shows the frequency graph generated from a 5 second section digitally transferred from the source CD. Note the strength (amplitude) of frequencies above 15 and 19 kHz. Ideally, recordings should closely match this graph. Figure 2 graphs the same section of music digitally recorded on DAT. Note that most frequencies are reduced in amplitude. particularly noticeable above 15 kHz but are still present. The frequency response closely matches the original. Figure 3 shows the graph of the digital MD recording. A drastic cutoff of frequencies above 19 kHz (approximately) is very obvious here. Figure 4 shows the graph of the analog MD recording. The removal of frequencies above 19 kHz is again very obvious. It is important to remember that the recording level had to be set manually and could account for changes in the overall amplitude of this recording. Seeing may be believing, but hearing is something else in this test. I listened to all of the recordings numerous times (using high quality headphones) and although I could see the difference in the graphs, to be honest, I really could not hear anything significantly different. Even comparing the analog and digital recordings of MD and of DAT I could not detect any really obvious differences. Figure 5 shows a graph of the 20 Hz - 20 kHz sine wave sweep source. When compared to graphs from recordings on MD and DAT, I found that they were nearly identical. Strangely, MD did not exhibit the same cutoff as with the musical tests. This has to do with the way that these audio data compression algorithms work. If there is sufficient space to record the full frequency spectrum, MD will generate a more accurate frequency response. This can be seen in Figure 3 (around the 0.06 and 3.75 second points) where frequencies momentarily jump to full spectrum. However, complex passages such as are usually present in music require high end frequency filtering in order to encode the more important lower frequencies. DAT clearly provides better sound quality than MD and DCC; and when you compare the graphs, it is easy to see the difference. The real test though is not one of comparison; because in the end you will, in all likelihood, be distributing your recordings on CD or analog cassette. The majority of listeners will never be able to tell what kind of machine you used to master. It is only important whether or not the recorder you use creates a good reproduction of what you are recording. MD offers many advantages over DAT, primarily in its editing and fast access capabilities. From a physical point of view, MD stands proud with practically unlimited re-recordability and durability. Tape is inherently more fragile than disc, suffering from the possibility of degradation over time and entanglement or breakage. The recording medium for DAT and MD are equally priced, but that is not true of the recorders. Expect to pay twice as much for a DAT recorder than a MD recorder. 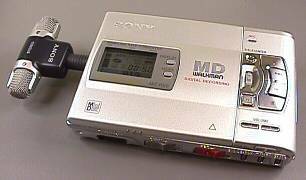 I recently sold our highly-acclaimed Teac DA-P20 portable DAT recorder and replaced it with the super-small and efficient Sony MZ-R50 MD Walkman equipped with a Sony ECM-DS70P stereo microphone. We use it extensively in the field to capture live sound. Also, its auto-date/time feature is perfect for keeping an audio diary or just taking notes. Now, if only the Amiga had some good speech recognition software! For final mastering though, we will continue to use DAT... at least, because we have that option. Thanks to The Sony Store for their assistance in providing test equipment for this article.